Believe it or not I'm a bit of a shopaholic- yet I never really post my hauls on here. That should be very rarely infact. So I've made a conscious effort to photograph things as I buy them to show you instead of you seeing them in a review/outfit post etc. First up is a cheeky Elf order I placed the other week while there was free delivery. I'm quite a fan of Elf studio make up due to their high quality of products for £3.50 and some of their £1.50 eye brushes are fab and use on a near enough daily basis. Now considering I had been trying my hardest not to spend money due to my car needing its MOT/Tax (on a side note it cost be bloody £78 to get a SPRING fixed- robbing gits). Anyway I digress, so I only restrained myself to the three make up brushes I desperiately needed. Powder Brush- out of all the Studio line this is the one brush which has been raved about on so many blogs and I've always been meaning to purchase one, but never gotten around to it. It was actually between this and the Real Techniques Powder brush, however I'm more than happy with this brush and glad I purchased it. Normally I use this in one of two ways- if I'm wearing Mac NMSF as a foundation I will use this to lightly buff the product into my skin. Or I will use this to apply Soft and Gentle MSF as a highlight. I'll hold my hands up if I'm being a lazy cow, I'll use this to apply powder blusher or bronzer with. Personally I'm a big fan of the flat surface area as you can work the product into your skin better. I wouldn't recommend this for liquid foundations. 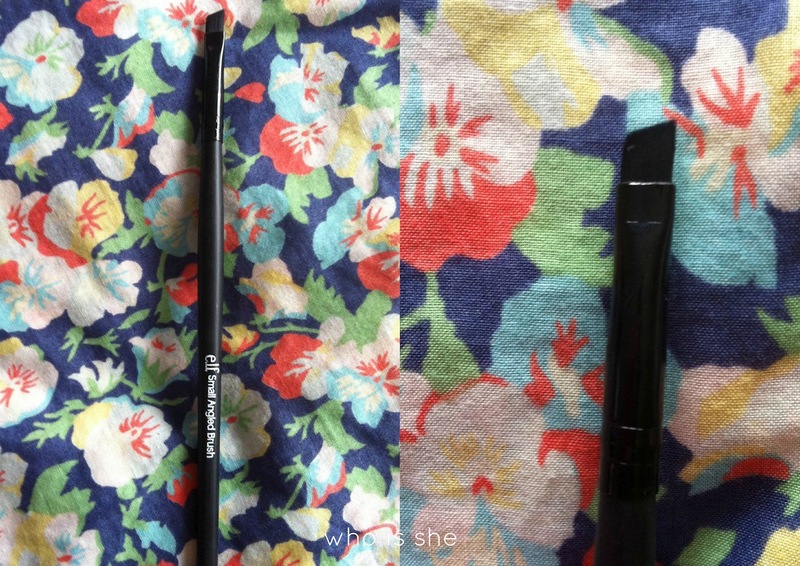 Small Angled Brush- I bought this purely to use with my Browzings kit, as the Mac angled brush I use to apply gel eyeliner with. I've only used this brush a couple of times, as I haven't been anywhere which I've felt the need to fill my brows in. However when I have used it, I've been very happy with the results- I would say the brush is more "harder" than the Mac one and works well with brow powder. You could use this to apply gel eyeliner however personally the line would be too thick. Definately recommend this for your brows. 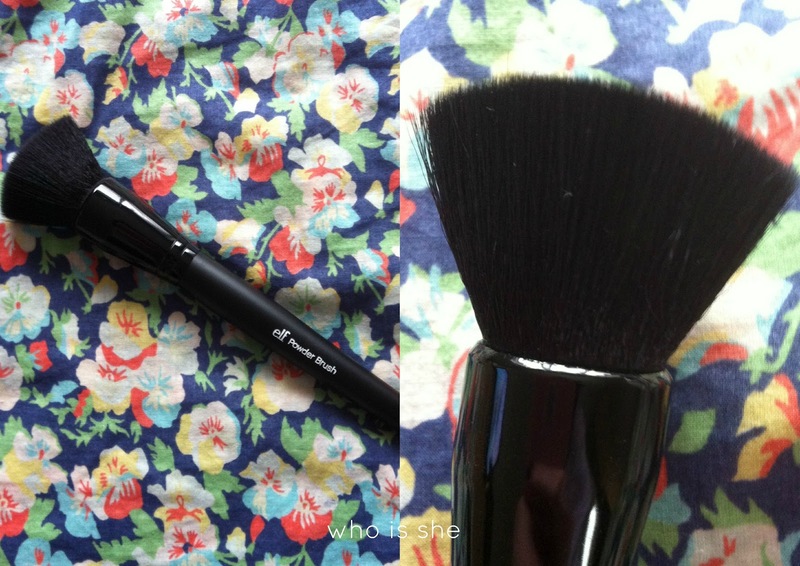 Angled Contour Brush- the one brush I have been disappointed with. 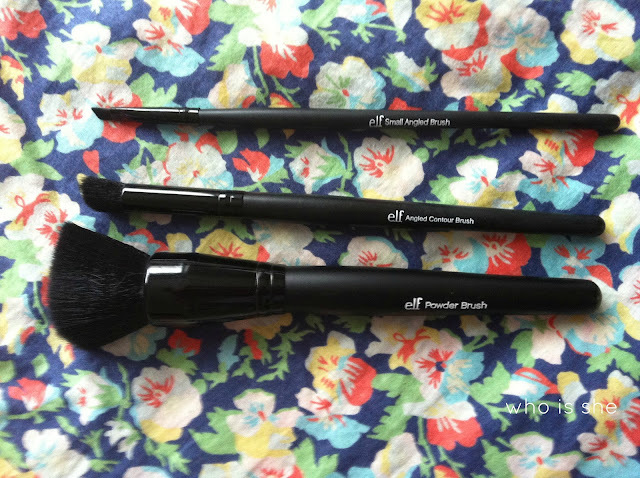 Recently I've been experiementing with contouring my cheekbones and I thought I would pick up a brush designed for contouring. I was so disappointed when I opened the parcel and saw this pathetic excuse for a brush- its TINY. Like teeny tiny, as in it would do a better job of being used to apply your eyeshadow base colour. I've found with this brush it takes too long to contour, when realistically a larger surface area brush should be used. 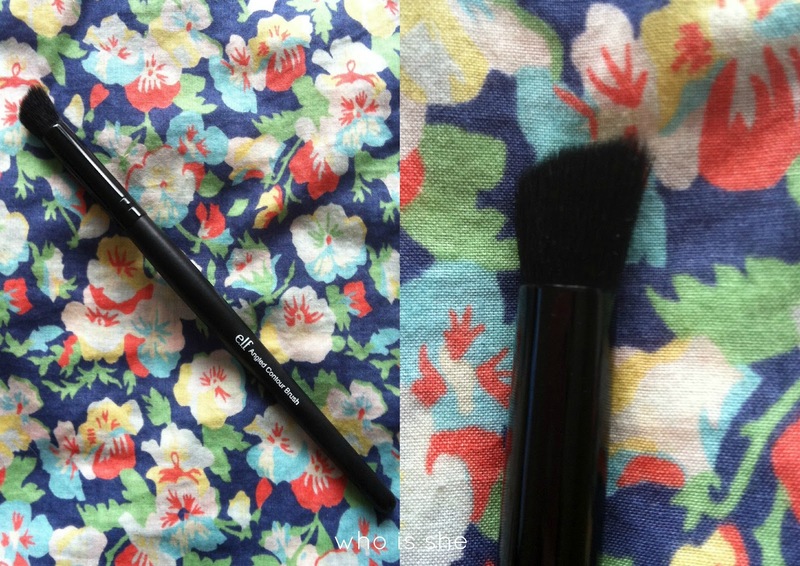 If you are looking for a cheap contour brush- I wouldn't recommend it. What are your thoughts on Elf Studio brushes?